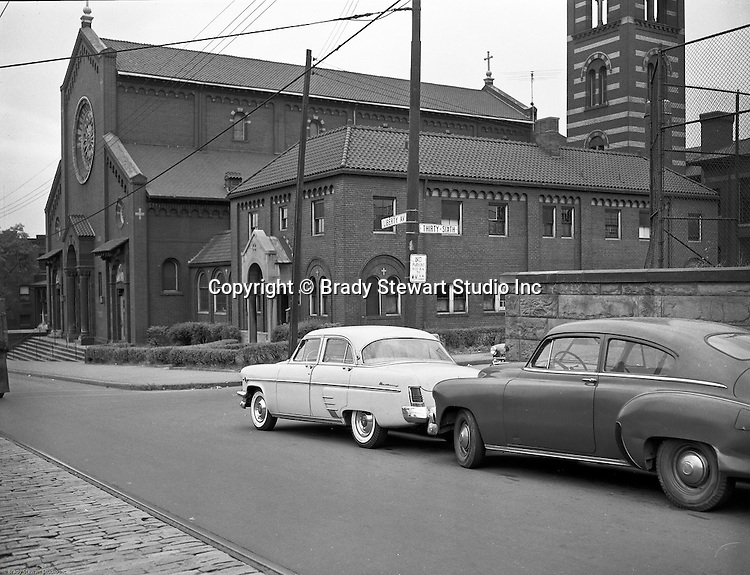 Lawrenceville section of Pittsburgh: View of the St John the Baptist Church on Liberty Avenue and 36th Street in Lawrenceville - 1957. Founded in 1878, this Catholic Church served the Lawrenceville area of Pittsburgh. It.steadily expanded until the early 1900’s. The church survived a fire, flooding, and the depression..By the late 1950’s when steel mills started to close, the.Lawrenceville population declined, much like the rest.of Pittsburgh. Major parishes, including St. John the Baptist, began to lose members. Due to financial and organizational circumstances, the Diocese of Pittsburgh restructured the churches in its jurisdiction in 1993 and St. John the Baptist was closed. Brew Works purchased the building in 1995 and developed it into a restaurant and brew pub. The Church Brew Works opened for business on August 1, 1996.